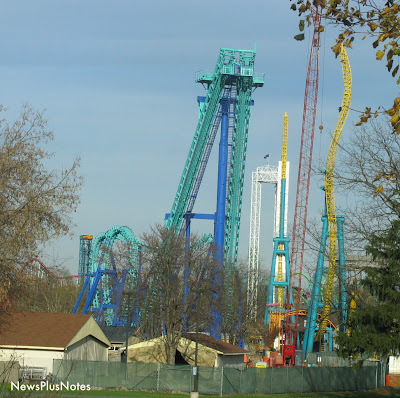 It's been a while since we've checked in on the progress of SkyRush at Hersheypark, and in that time quite a bit of the project has been completed. Take for instance the fact that both supports and track are now in place! 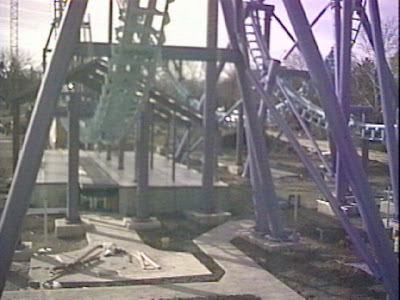 The park has been working in some tricky conditions while building SkyRush - mainly due to the fact that they are working directly in the middle of a creek bed. 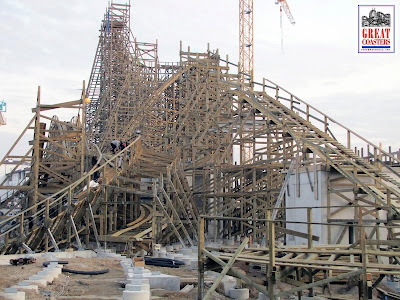 Even with these challenges the park has managed to complete almost all of the footer work in the main section of the ride, which will take place over the creek. Even more exciting though is the addition of track in one small area, and supports in several. I admit I wasn't sold on the ride's colors at first, but seeing it come together has me sold! For lack of better words, SkyRush will add a lot of personality to the Comet Hollow section of Hersheypark. For photos of the most recent work, head over to Keystone Thrills. If plunging 110 feet toward the ground at 60 miles per hour in a beautiful seaside setting sounds like fun to you, then you'll want to check out Coney Island next summer. In addition to the already existing - and thrilling - Luna Park and the Scream Zone, Summer 2012 will see the opening of the Speed Zone. 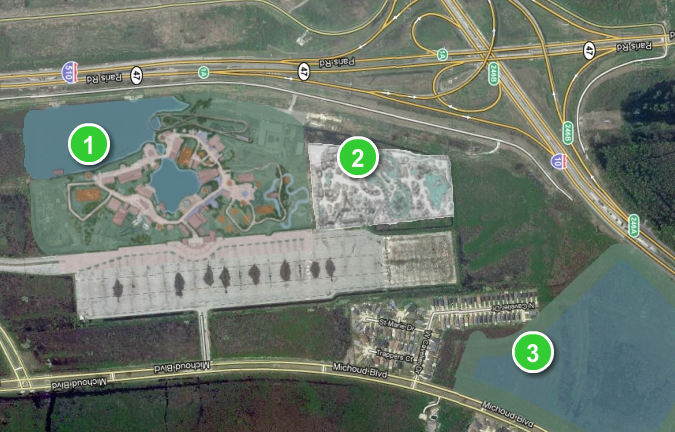 Shown as Parcel C in the above map of the area, Speed Zone will be the third and final area to be developed by the CAI, the amusement park managing arm of Zamperla rides. The main attraction of area will be go-karts, making the speed in the park's name quite literal. A longtime staple of Coney Island, go-kart have been missing from the area for several years. The other attraction in Speed Zone that will gather much attention is a new 110 foot tall SkyCoaster, a thrilling ride that combines sky diving and bungee jumping, already popular at a slew of parks around the globe. From the look of the area's layout, riders will be potentially swinging out directly over the boardwalk - that'll make for quite a spectator sport of its own! Only six weeks have gone by since Legoland Florida opened to the public, and the park already has expansion on their mind. 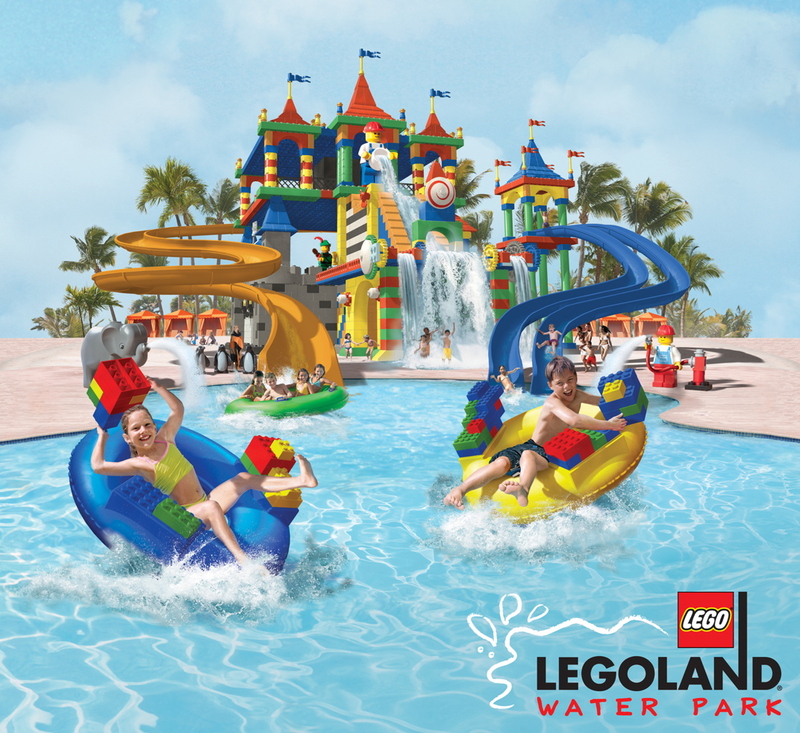 The property has formally announced the addition of the Legoland Water Park, to be opened next to the theme park in Summer 2012. The park will feature many attractions, including water park staples such as a lazy river, tube and body slides, and an interactive play structure. “We’re very excited to share plans for this amazing new attraction,” said Legoland Florida General Manager Adrian Jones. 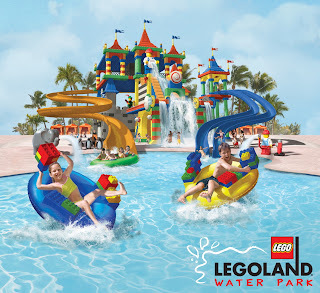 “True to our mission, the water park attraction has been designed for families with children ages 2 to 12 and will add hours of water play to an already full day and move Legoland Florida into a multi-day experience for vacationers." 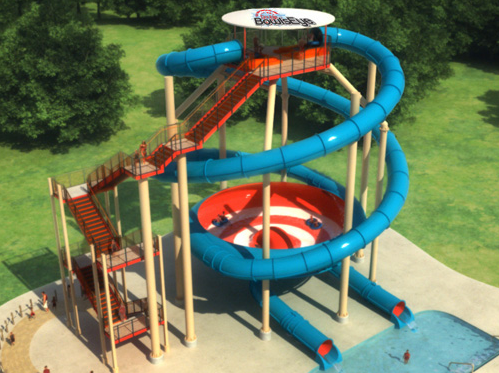 Attractions at the park will include the Lego Wave Pool, with waves sized for families, the Twin Chasers, an intertwining pair of tube slides stretching 375 feet, and Splash Out, the tallest slides at the park which offer three different ways down the 60 foot tower into a pool below. The Joker Soaker features a 300 gallon bucket that tips its contents onto the crowd below, in addition to tons of water gags and other play structures. A unique feature is the Build-A-Raft River, where families can design their own Lego vessel then set sail around the 1,000 foot course. For little ones, the Duplo Splash Safari will feature small slides and large interactive Duplo creatures. Much like at Legoland California, the water park will be an add-on to a day's regular admission ticket when the park opens. 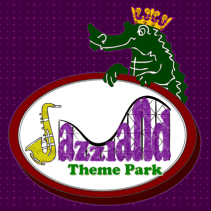 You can refer to it as Jazzland or Six Flags New Orleans, but the story remains the same - this has been one troubled theme park. First opened in 2000 under the moniker Jazzland, the property struggled along for two seasons, after which Six Flags came in and took over the park's lease. From there a few years of moderate expansion followed, but still without the return that Six Flags was looking for. 2005 saw the devastation of Hurricane Katrina, which shuttered the park for good. Several plans to revive the park have surfaced since, one plan even went as far as announcing that it would reopen with Nickelodeon theming - but nothing has panned out. Just recently it was reported that different uses for the park were being considered, and that eight proposals had been submitted. The uses for the land ranged from theme park all the way to energy production, but one group that submitted a plan has now launched a website. I know it's just a plan - but there's some cool looking slides in the mix. I see a set of dual water coasters, aqua loops, bowl slides, two wave pools, a large lazy river, family raft rides, extended mat racer, and more. 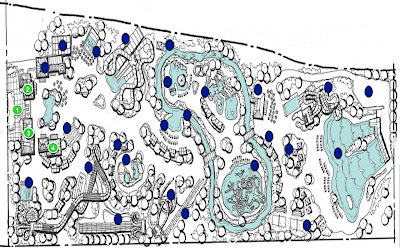 As for the them park, plenty of changes would occur as well. The park's headlining coaster, MegaZeph, would be refurbished by the Gravity Group, including new trains with audio. A large new river rapids ride would be constructed in a newly themed Sportsman's Paradise area, and The Beach section would feature a drop tower ride disguised as a famous lighthouse. One of the tamest, but most intriguing attractions would be the Sea of Love, a recreated Tunnel of Love ride - something we haven't seen built in ages. The Jester coaster will remain, and a new junior model will be added to interact with the river rapids. There's plenty of details available of Paidia's website for their plan, if you look around. 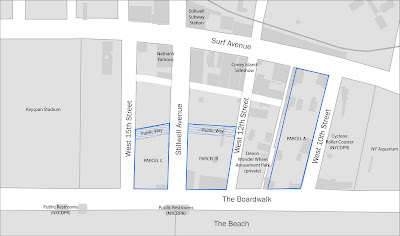 Their plan also includes using extra land for a film studio backlot, and interesting choice. About half of the eight proposals being considered involve a theme park, so there's plenty of other options out there. Plus, there's no talk of where funding for this (and the other) proposals is coming from, which would make anyone nervous. Even if the park never opens again as anything at all, it's pretty fun to see what others have cooked up in their dreams. Not that it is much of a surprise to me, but the new Great Coasters International ride going up at Europa Park is looking fantastic. In the most recent batch of photos, like the one above, there are so many details to pick out from the work that has been finished it is almost overwhelming! 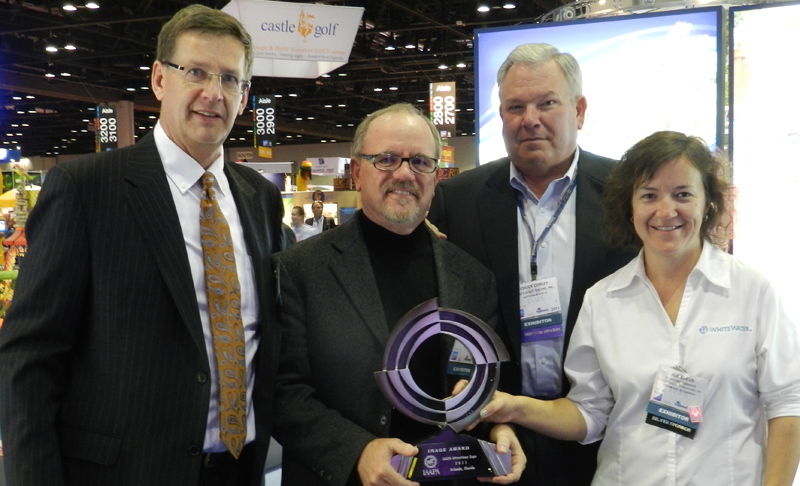 WhiteWater was bestowed IAAPA's Image Award, given out for the most outstanding presence at the trade show. The company's booth focused on Innovation, something the manufacturer is quite proud of with new slides like the Family Python, transparent flumes, AquaCourse, and the AquaPlay Giant RainFortress. 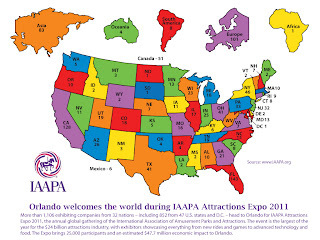 Speaking of the 2011 IAAPA show, this year has been deemed a success with over 25,800 registered attendees, up 3 percent from last year. The event also raised $81,000 for Give Kids the World through various special events. Curious to see the color scheme of PortAventura's new Bolliger and Mabillard mega coaster? Check them out at this link - the ride will feature dual color track, and some nice contrasting supports. This is going to look great! Fans of Waldameer Park's pair of classic dark rides will love this new DVD, just released by Laff In The Dark. 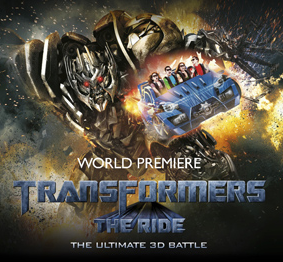 The DVD takes a guided tour of both of the rides, a preview of the film is above. Check out more about the title here. It took this update from Westcoaster for me to finally be able to understand how the layout of SeaWorld San Diego's new Manta coaster will fit in the park. 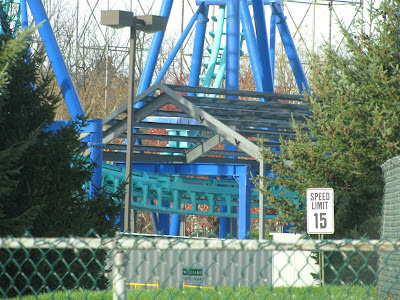 If you go and take a look, you'll also see that a big station for the coaster has been set in place as well. The ever excellent Amusing the Zillion has an exclusive look at what's new on the Coney Island boardwalk in 2012 - including Zamperla's new Speed Zone development. Check out the details on what's coming. With track now complete, the Swarm at Thorpe Park is starting to have its elaborate theming put in place. The ride's Developer Diary is following this for us quite nicely, showing off some recent clearance tests. There are eight companies that have submitted proposals for what to do with the former Six Flags New Orleans site. The plans range from a theme park, water park, movie backlot, and even to a power station. The future of Lo-Q and Six Flags is bright - the contract for the skip-the-line access program to stay at the theme parks has been extended for another six years. Also, the use of the bots in water park, which started this past year, will quickly be rolled out to additional parks. 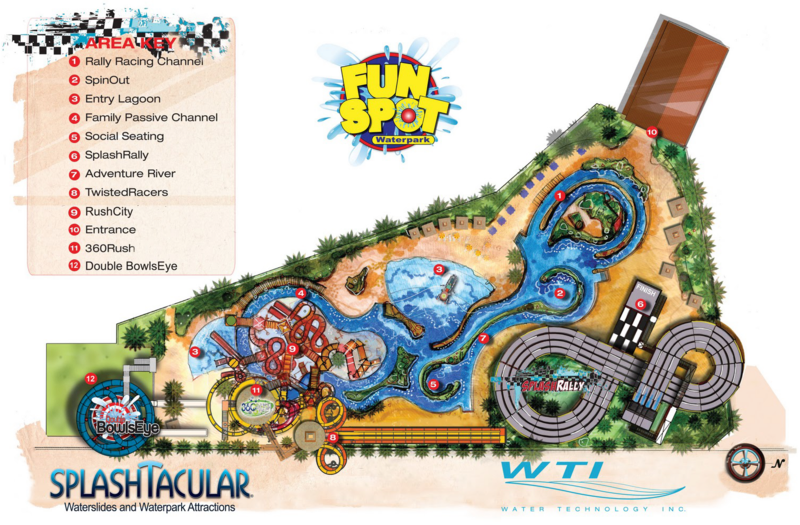 One of the major manufacturers involved in Fun Spot's new water park has released some additional details about the development, which makes the new area sound even more exciting than before. Splashtacular, a company that creates some unique slides and attractions, will provide most of the rides that will go in the new area. According to Splashtacular, "our best work comes from collaboration with specialists who are the best in the industry, which is the reason Water Technology, Inc., the premier design group in the water park industry, was selected by John Arie to create a one-of-a-kind, state-of-the-art, signature water park, that satisfies their financial and demographic objectives." 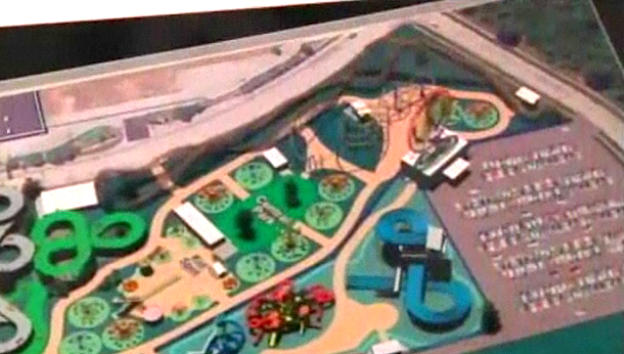 A more detailed layout of the park (seen at the top of this story) that was released reveals some of the unique slides going in - in fact none of them will be duplicated in the park's market. Directly above we see a Double BowlsEye, which features two separate tube slides that empty into the same bowl. Another attraction slated to be built is the 360Rush. 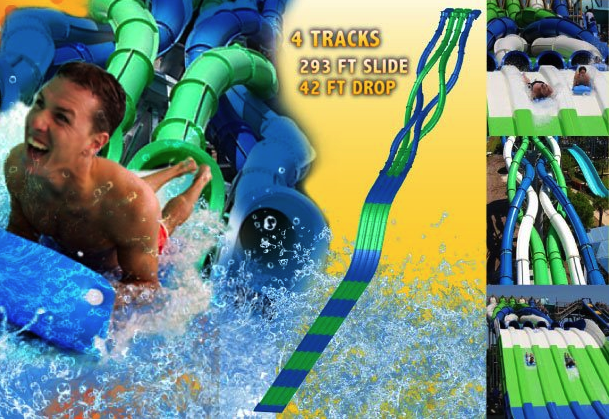 This towering slide consists of two different body slides that release riders simultaneously. Each rider plummets downward and then into a large bowl where they "chase" each other as they spin. Both riders eventually come to a stop in a shallow center pool. The racing theme continues with SplashRally, a four lane slide that puts passengers in a race to the finish line. There will also be a large water play structure, lazy river and more when Fun Spot's water park opens. These attractions should prove unique to their market, and draw some attention for the park. Add to this the new pair of roller coasters and other rides, and the future certainly looks bright for Fun Spot! 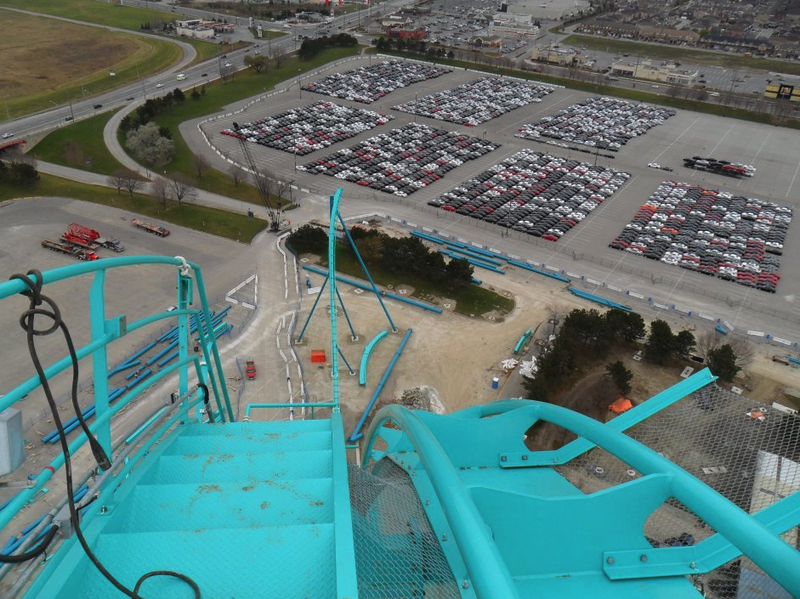 Last week saw a major milestone for Leviathan, Canada's Wonderland's new 306 foot coaster - the tallest Bolliger and Mabillard design to date - when the lift and first drop were completed. As you can see in the above photo, the view from the top is pretty amazing. 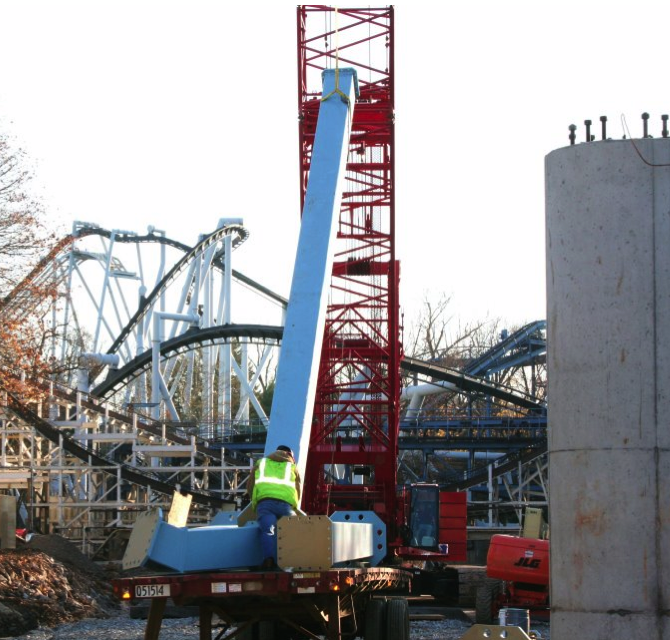 The park's blog for the ride detailed the process of finishing the structure, which involved four cranes and quite a bit of maneuvering. Well worth the effort, I say! Make sure to check out all the new photos posted by the park. They are also reporting at foundation work is complete, and with the lift/drop out of the way now they can move on full steam ahead! Happy Thanksgiving! Hopefully you have plenty to be thankful for on this day, I know I do. 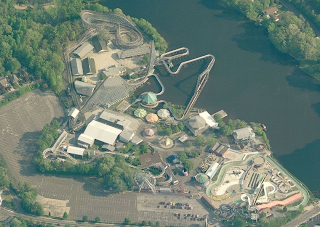 In light of this blog however, let's be thankful for some recent park announcements! Waldameer Park is advertising "plenty of new things" for next season, coming off of this year's large North End expansion which contained three new rides. Next year the Happy Swing will take up residence in Kiddie Land, near the Ravine Flyer 3. This kid-friendly ride has been popping up in many parks, namely the Planet Snoopy expansions seen this past summer at several Cedar Fair parks. Waldameer's relaxing train ride, the L. Ruth Express, will also welcome a second train in 2012 to reduce wait times and add capacity to the popular attraction. For a sneak peak at the train, check out the park's recent blog post on it. Dark Ride fans will also be happy to hear that the park's Wacky Shack will have a redesigned loading area that will provide better and faster loading, a big plus. The park will also move to being cashless in 2012, using Wally Cards for transactions that take place inside the park. 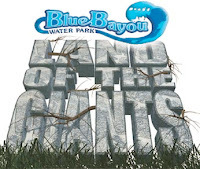 Dixie Landing and Blue Bayou water park is known as the Land of the Giants, as they have a penchant for building only the biggest models of popular slides. Next year will be no different when the park builds a brand new Aqua Loop water slide. 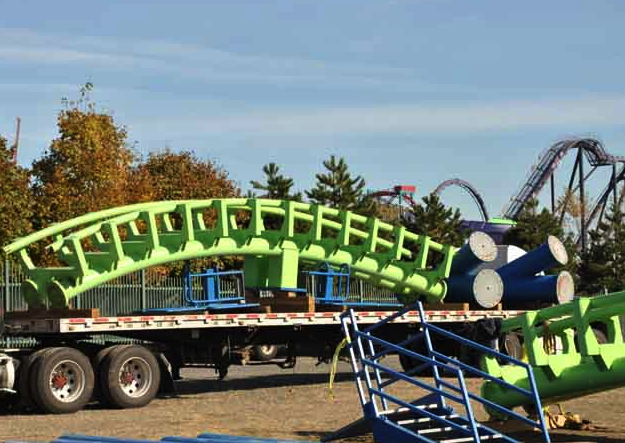 The park shared a photo of a 4 slide version on their Facebook, but mention the ride singularly on their website, so I'm not sure how large this instillation is. 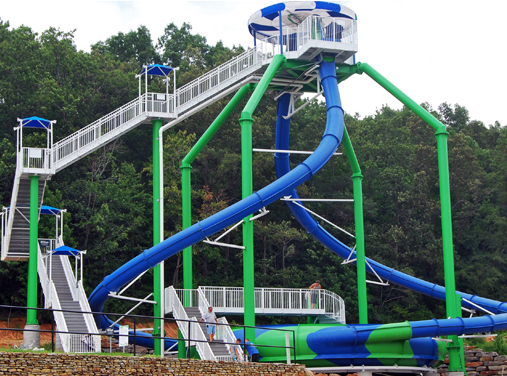 Either way, Aqua Loop slides have become quite popular as a high level water park thrill slide. I have a feeling this will fit in rather well with the park's existing mega-slides. Other enhancements will also take place, such as renovations to the park's existing lazy river and an updated Bathhouse. Fun Spot Action Park - 2 New Coasters and a Water Park! 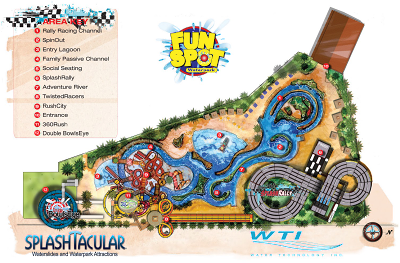 Earlier this year we heard about some plans for Fun Spot Action Park, located in Orlando, to expand to three times its current size. No definite plans were set at that point, but the expansion sounded quite aggressive. Using the new 10 acres of land purchased, Fun Spot is now ready to unveil plans for their expansion, which happens to include not one but two new roller coasters, more rides and attractions, and even a water park for visitors! The newly expanded park will be known as Fun Spot America, and will keep the same pay as you go system that is currently in place, sans the water park which will be general admission. Please excuse the quality of this screen grab, it's from a news piece on the expansion, and it shows the park's two new roller coasters. Well, sorta shows them. It's a bit too blurry to make out much but the wooden coaster looks larger than I would have expected, having a classic out and back layout. The steel coaster is near it, but I simply can't make out much about it. No way to tell right now if this is a final concept, or something more blue sky in nature. Hopefully more details will be announced by the park soon, which is still depending on approval from the city for their plans. If all goes well the new area could open in 2013. Meanwhile, on the other side of the Earth Universal Studios Singapore is getting ready to officially open Transformers: The Ride on December 3rd. The long awaited attraction will also be opening at Universal Studios Hollywood next year, but the Singapore version will be thrilling riders in just a couple weeks. Well... actually it appears as though the ride is sporadically opening for previews already, meaning that if you look around you can find plenty of photos and ride descriptions, much like this. Naturally, if you do not want any spoiler information than that link is not for you. As far as official information goes, well the park has released the above teaser video on their official Transformers blog. The shots of both the ride and the vehicle draw immediate comparisons to Spiderman, but that was expected. Seems the jury is still out on whether Spidey will remain king, or be dethroned by Transformers. We shall see! After announcing some time ago that they were shopping both Clementon Park and Alabama Adventure, Adrenalin Family Entertainment has sold the former to ex-Six Flags executive team Gary Story and Kieran Burke. 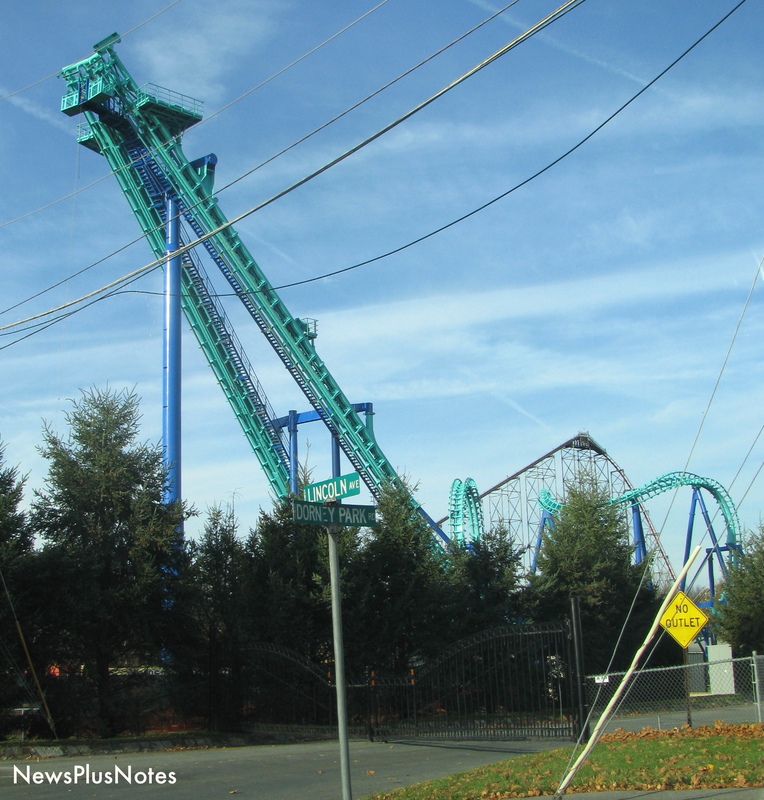 While no details of the transaction were released, the purchase of Clementon Park comes after AFE spent several years expanding and modernizing the park. 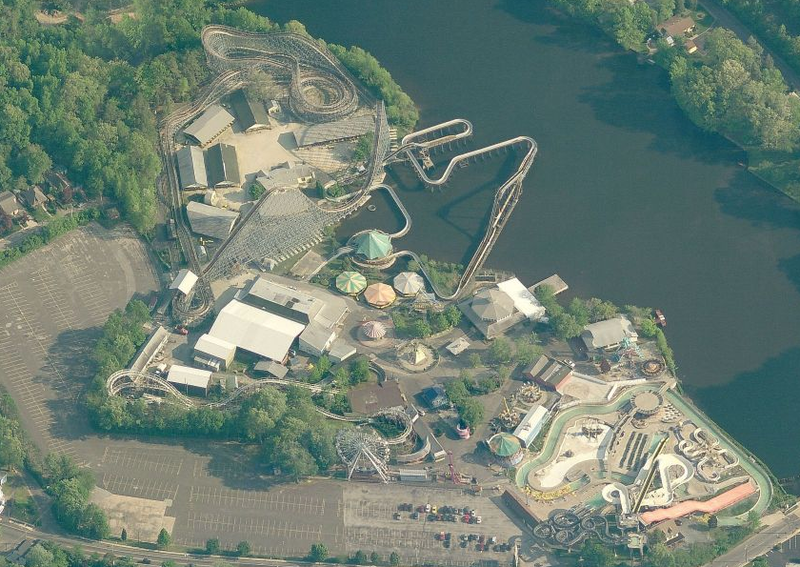 Recent additions to both the water and amusement parks have helped to keep the park relevant in the crowded New Jersey marketplace - exactly one of the reasons why Burke and Story were interested. This past summer Clementon added Torpedo Rush, a pair of floor-dropping speed slides, and before that the Ring of Fire flat ride. The park's entrance had been updated, and a large family water play structure was added as well. The park's new owners are promising some new goodies for 2012, but are not ready to announce anything quite yet. Two of the park's top management individuals will be retained to transition the park into its new ownership. Kieran and Burke have recently purchased both Ocean Breeze and Nashville Shores water parks, and currently operate Frontier City. 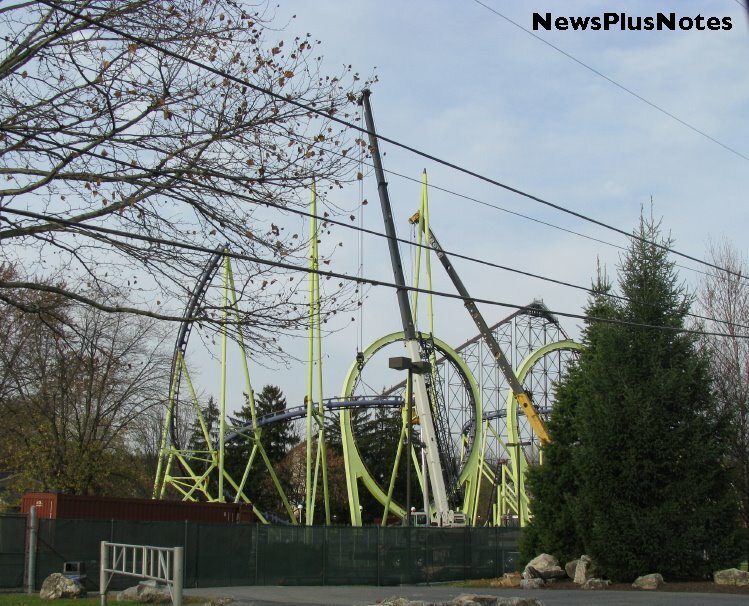 Lake Compounce is getting twisted in 2012 with the addition of Riptide Racer, a brand new water slide attraction. 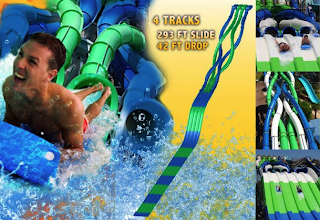 Created by Proslide, the Riptide Racer will feature four separate slides, which pit riders against each other in a race to the finish line. A new take on the popular racing mat slides, the ride looks to be a part of Proslide's Kraken Racer series. This style of ride just debuted this year, and is available in many different sizes, including a 4 lane model. The tubes that make up the slide, which stands 42 feet high and each stretch 293 feet long, actually are braided around each other, creating an interesting visual. The high capacity racing slide will help crowds in Lake Compounce's Splash Harbor water park, which is extremely popular. This year the park started the process of moving an adjacent road that was hampering water park expansion, freeing up land for this new slide. Even bigger plans are said to be on the horizon for 2013. New England winters can be pretty rough - so it makes an awful lot of sense that Six Flags New England is hard at work on Goliath, their transplanted Giant Inverted Boomerang coaster for next season. 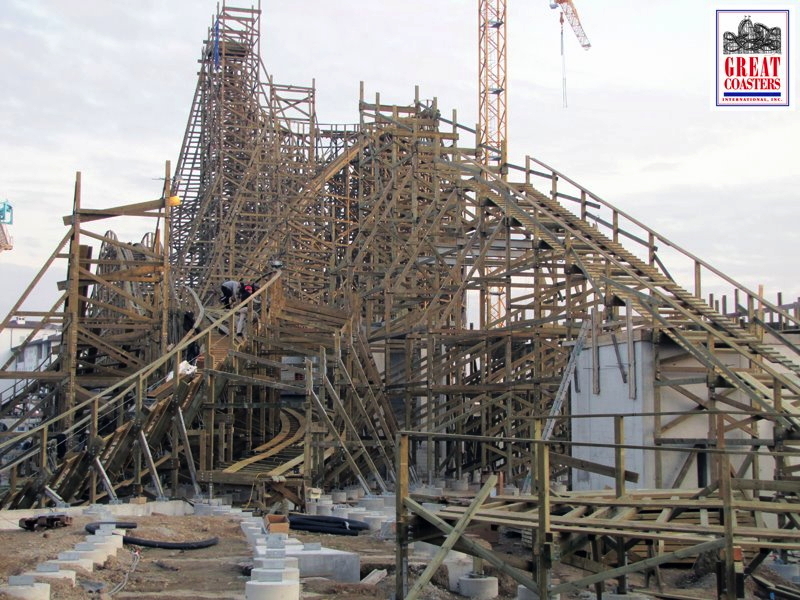 In a large series of photos posted to the park's website, the ride's progress is proudly shown off. 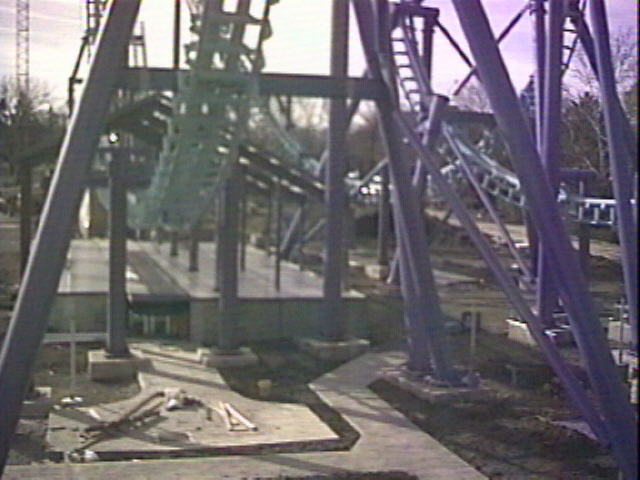 This includes plenty of work on the massive footings that are required for the coaster - several of which are well underway. Loads of track and supports have been arriving from California, now waiting to go up in their new home. While on the subject of the ride in California, you can also check out shots of the little bit of Deja Vu that was still standing last week. 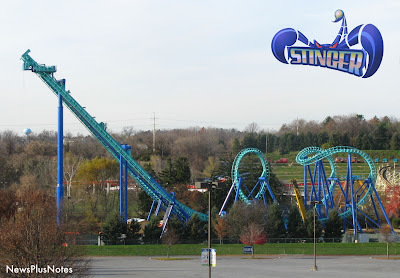 This is quite the off-season for New For 2012 coasters being finished before the year's even started - joining the club now is Stinger at Dorney Park. During the past work week the final lifts were completed, marking the end of track and support construction. 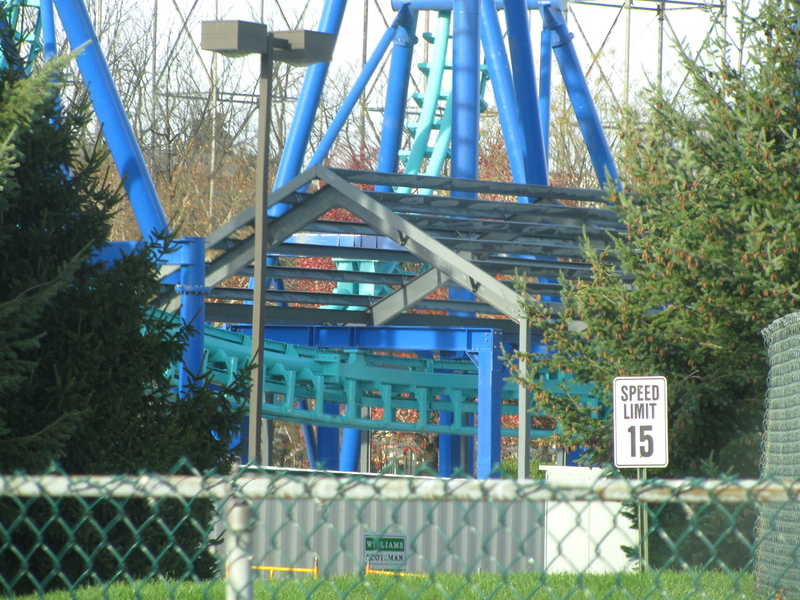 If I am correct, this is also the earliest that a new coaster has been completed at the park - very much in line with the way that Cedar Fair builds coasters in recent years. What used to be a Fall into Winter project, building coasters now seems to start as early as the Spring before the year of debut, leaving plenty of time for testing. Here's the completed ride in all its glory. While I enjoyed Invertigo's yellow and blue color scheme, I have to admit that I've grown quite fond on Stinger's palette. Funny how times change, eh? But back to Singer - the ride has had a nice looking station built for it, something it did not have when it resided in California. Anyone want to guess what color the roof will be? 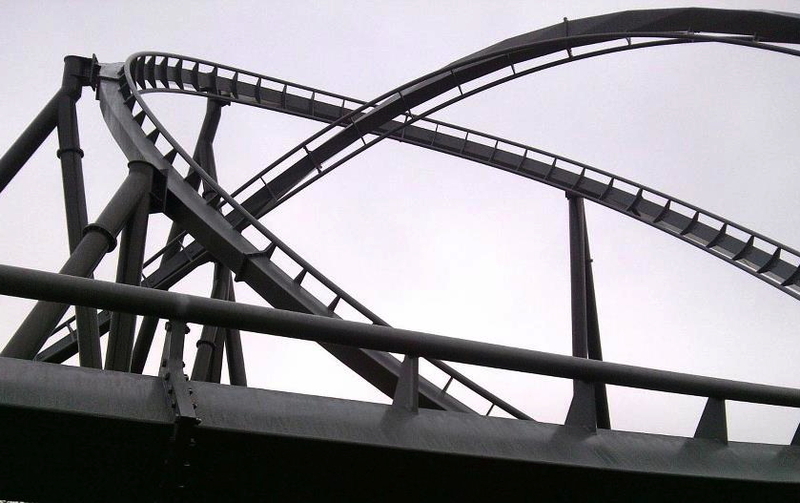 Here's a great example of the ride changing the park's skyline! Finally, since we can't get in the park to check out the progress, a grab from the park's webcam. You can see how the station floor is poured, and plenty of walkways are already in. They're really racing with this one, getting just about everything done before winter hits. Now that we can breathe, here is how all of Orlando, or at least the people who drove by the convention center, knew the show was in town. Here is a view of part of the show floor from one of the upstairs offices. This map shows the locations of the companies registered for IAAPA 2011. Who knew this many states would be represented? Here is the new train for the S & S El Loco. 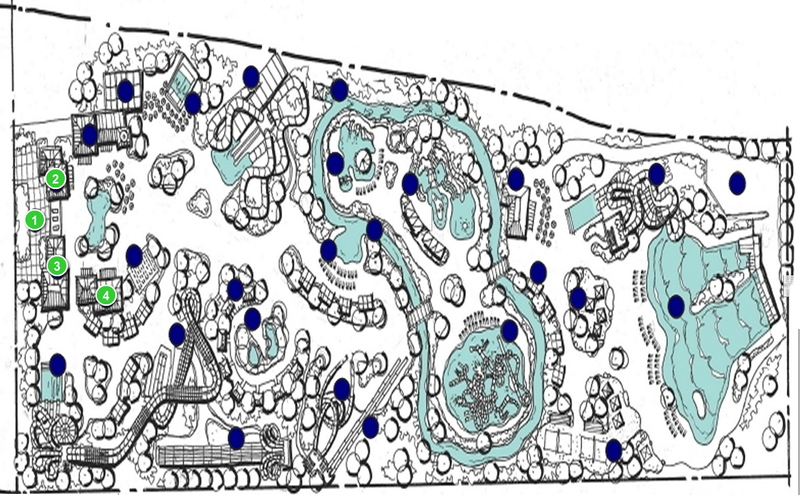 It was redesigned for more capacity for larger parks. It even includes a sound system, because for some thrillseekers, the natural roar of a coaster isn't enough. This is Green Lantern car is headed to Warner Brothers Movie World in Gold Coast Queensland, Australia, the coaster is scheduled to open in December of this year. The extent of the theming will only be legible from the station, because it will be difficult to read as the car goes upside down. All in favor of bringing on of these coasters to North America raise both your hands! Here is a scale down version of the new track from Rocky Mountain Coasters. And this was the coolest conference table at the whole show. We suggested that they consider offering these to those of us in the north who can't stay "on track" all year long. Here is the end-on view of the track. They won the award for the "Best New Product for Major Theme and Amusement Park Ride. Congratulations. This is something completely different, the coating on the inside of the light lets you look at it in the dark without being blinded. Soon to be in a night construction zone near you. It would also be useful for park maintenance workers who do much of their work at night. The fire marshal looked long and hard at this booth. Just another example of the wide variety of things parks use to entertain us. This is the latest idea from the creative mind of Stan Checketts. It takes one operator and the restraints a radio controlled for safety. Double seat belt allow for almost anyone to try a zipline. Since nothing simulates a relationship like flying downhill together, you can ride with your significant other and find out who screams first. How about a family ride? The smaller set can go for a spin with mom or dad for their first "thrill ride." Coming to a park or other attraction near you, henna tattoos are so passe. A peel off stencil, sprinkle on your favorite colors, some time to dry. This was as close as we got to the latest design from Bolliger and Mabillard. Scott lost a bet on this one. We tried this game but we stunk at it, so good bye from IAAPA 2011. From all the reports we heard on the floor, we should have some exciting things to talk about in 2012 when the rest of the announcements come through. A big thanks to all the companies who answered our questions.